I got home yesterday to Miss Butterfly and her friend doing homework on the couch together. Out back were two bikes they’d ridden home from school. I knew that this friend had lost her dog today, so we chatted about that. And we chatted about other things 12 year olds worry about. And then they were up and gone, biking around the neighborhood and seeing what there was to see. I realized that it’s really perfectly comfortable coming home to someone else in your home, if it’s a kids you really really enjoy. Once they had vanished into the neighborhood, I took my two spindles of singles outdoors for a photograph. And realized I could take a photo with plants. Because it’s a really nice spring we are having this winter. Yep, I’ve got hyacinths making an early appearance. And in fact, from what I read, these new bulbs planted should be showing up later than usual. Not so here, they are well on their way. I have all sorts of stuff coming up all over the gardens in the yard. Unfortunately, or fortunately if you like surprises, I don’t even remember what I planted and where. There were tulips and hyacinths and crocuses for sure. And maybe some additional daffodils. And I know I’ve got grape hyacinths too. But there were other things too, and those, if they show up, should be a surprise. As for those singles, that’s from a nice chunky fatcatknits batt. It has locks inside it, as maybe you can see from the purple. It should make a very interesting yarn. I took the remainder of the evening for spinning, working on my wheel project and then working on this project as well. I’ve now got 4 spindles of singles, though I feel like I may only be halfway through the batt. On the other hand, when I am ready to ply, I’ll be plying two projects instead of one, and that’s always fun! Oh, and as an update. The tattoo, just as I thought, it’s a very remote reference. in 1956 there was an animated cartoon short called Rocket-Bye Baby. You can still find it on youtube, but it takes a little searching. It’s cute, and Mr. Ink apparently always loved and identified with that cartoon. He’d been talking about getting this particular tattoo for as long as I’ve known him, so it was fun to see it come to fruition for him. It’s basically a couple of birthday/christmas gifts rolled into one. Tonight, if it does not rain, we’ll be on our bikes. Miss Butterfly has a running event she’s going to attend with her dad, she’ll be getting all sorts of rewards for the January MS fundraiser. She’s SUPER excited, as she should be. She’s also hoping for a new pair of running shoes, which will be massively marked down for the event. I am eager to hear all about it after she’s done. It’s been a pretty good week so far, despite the fact we are really early into it. Mr. Ink has gotten up early each morning to make us breakfast, which has been really fun. In any case, more spindle pictures tomorrow, and until then, I hope your week is going equally well. Guys, I’ve just had a truly relaxing weekend. I loved it! I really did actually stick around home all day on Sunday. I went for a walk, but that was just around the neighborhood. Other than that, I enjoyed just being in my own space. I’ve certainly been feeling like with two larger projects on the needles, I am unable to post progress pictures that look different from the day before. However, if I have a long enough time at home in my own space, I no longer think “There’s no TIME to work on anything else!” And I just kind of naturally pick up other projects. I finally got some serious spinning done on my dyeabolical mash up project. Here’s my second bobbin. Looks like I might be about halfway through at this point. I also picked out a batt and began spinning that on support spindles. That was later in the evening, so a photo of that will be taken after work today. I refuse to start any new knitting whatsoever. The reason? I found my fade. I’ve been loving the pictures of that shawl all over the place. I’ve been contemplating it and wondering what I would choose if I chose yarn for the project. It’s really one of those addicting patterns to look at and contemplate. The last time I remember feeling that way was about the color affection shawl. And, my choices there did not disappoint, it has become one of those staple pieces in my winter wardrobe. You know what? I just tried to find good photos of it, and there are none! And my project notes say I didn’t like knitting it. I don’t remember that at all! In any case, I found my fade, but my fade came from a shop. It’s a special order, so I have to wait until mid march for it to arrive. So, my hope is that I will not cast on anything new, so that I can cast on Find Your Fade as soon as that yarn comes in. That shouldn’t be too problematic. I’ve got my cotton slub shawl, I’ve got the lace stole, I’ve got Mr. Ink’s socks, and I’ve got Miss Marja’s reversible circles of lace scarf. This should totally tide me over to mid march, don’t you think? And if not, there’s always spinning. Doesn’t seem like a particularly tough list to manage, it’s just planning those projects out, deciding on patterns, choosing yarn, and sticking to the plan. It’s so rare these days that there are new techniques I’d like to try, so I owe it to my knitting journey to accomplish them. What techniques would you still like to learn? I worked on the lace stole for a bit yesterday, took a walk with Miss Butterfly, did the tiniest bit of spinning, and then decided that my cotton slub shawl needed some love. So, I added another color, this one being a more muted yellow than the first yellow. Next up is another blue, and then a purple. I am certainly looking forward to the purple since it’s been all blue and yellow so far. As you can see, it’s a nice sunny day here. Yesterday was colder than expected so while there was much melting going on, the snow didn’t all disappear like I imagined it would. Now, the reference for the picture here was quite obscure to me, so you’ll have to let me know if you know what it is. I’d love to see if it’s just as obscure to others. In any case, he seems pleased with it. He used the same artist I did for my spider. An artist who is very talented but also extremely quiet. Mr. Ink, also being a very quiet person said he typically likes to use artists that will talk to him so he’s distracted. But, this guy’s artistry won out. I asked him how it went and he basically said that no one said a word once they got started, but that he played good music so that was helpful. I admit, it made me laugh. It went exactly as I imagined it would. I have already decided that if I use that artist again, I will be charging up my phone and bringing headphones and an audiobook. I was trying to figure out what the heck to take a photo of in order to post something, anything, despite the fact that don’t feel like I’ve made much discernible progress lately. I mean, I’ve been knitting. Oh, I’ve been knitting. But plugging away on the same lace stole doesn’t seem picture worthy. And then I realized that the last photo I took of my Lighter Than Perfume stole I was only about 1 repeat in. So, I took an updated photo of that. Because I am now halfway done. Naturally, this one is going to see the best transformation when it is done and blocked. However, I am pretty sure you can get the picture when it comes to the progress I’ve made. We ended up getting a couple inches of snow, but the roads were fine, mostly just wet. It didn’t hit during rush hour, and by the time afternoon rush hour hit it had slowed again. I suspect it’ll be gone by the end of the weekend. But it was nice to sit at work and actually see some good snowing going on. Our biking friend who got hit by the tree made the newspaper. Thankfully, local friends who work with city services have asked that the trail in that area be looked at for dangerous trees. That’s about it from me today. It’s early, I am feeling surprisingly groggy and tired, and my coffee doesn’t seem to be doing the trick. Hopefully I’ll rally later in the day! Have a great weekend everyone. I feel like I may turn into a bit of a boring knitter here. I’ve got my handspun lace stole going, and it’s progress is very slow. I’ve got Mr. Ink’s sock, but he doesn’t really need a new pair right now so I have been trying to save it for moments when we are out and about or when I am just too exhausted to knit anything but around and around on the simplest of socks. I did start a boomerang shawl though. The pattern is Big Waffle. This is what I decided to use as a pattern for my cotton slub yarn collection. I really had a hard time making a choice! So much of what I wanted to do was garter stitch, and I didn’t think garter stitch would show off the slubs too well. Settling on basket weave seemed to work. I then decided I’d just do color blocks. I took the balls of yarn and weighed them. Then I arranged them in order of smallest ball to largest. I had to rearrange the colors a tiny bit to look better next to each other, and then I was off on my knitting journey. I am 3 colors in now, and I am pleased with the results. My plan is simply to keep knitting until I run out of all the colors. And then I’ll have this lovely scrunchy large cotton shawl to wrap up in on spring evenings. I can imagine it being a perfect shawl to take camping, or out by the fire, since cotton so nicely washes in a machine and won’t need a bunch of blocking to put it to rights. This one has really demanded a bunch of my attention lately. The pattern is great, it has a chart which is what I generally work from, but in addition, it has a lovely, clever, written pattern grid, which keeps everything perfectly logical as the pattern repeats, and it’s so easy to follow. For once, I am choosing to knit from the written pattern rather than the chart! In general with the lovely weather I’ve been knitting less and being outdoors more. It is so much LIKE spring out there it’s hard not to do that. However, temps begin to drop tomorrow and it will rain, then snow Friday. So, this weekend may look a lot less like spring, and more like knitting season. We need it. The rain and the snow. Everything is so dry! I would secretly love a snow day. But, even if Miss Butterfly has off, Mr. Ink had already taken that day as vacation so I should just go in, especially since I’ve got a lovely all wheel drive vehicle that makes the snow slightly less dangerous and a lot more fun. That’s about it from this corner of the blogosphere. Hopefully more interesting things will happen this weekend. Not things like trees falling on friends though. I like some adventure, just not quite that much! The sweater is finally done enough to actually wear. Which is lovely. Except that it’s too warm here for a sweater! Next week looks better for sweater wearing. I tried to wear the sweater yesterday, but maybe managed 10 minutes with it on, more as a jacket than anything else. There you have it folks, one completed sweater with extra long sleeves. Which I love. I also love that after years and years, it got done! I didn’t rip it out, give up, or throw it out. I did actually complete the project, persisting through quite a lot of confusion and time away from it. A few other things, this is my nephew! Isn’t he precious? I can’t wait to meet him this summer. Living so far away, I am fortunate that my sister in law is a photographer, so I do regularly get to enjoy viewing the most beautiful photos of their children. All spirea twigs without egg sacs went in the truck for a load to the yard waste place on Friday when he has a day off. All twigs with egg sacs stay at home. My coworker is worried that raccoons may get to these an find them tasty, but my thought is that there are tastier things in the garbage can, and it’s never been bothered. So, I think we are safe. We’ll see. Also due to the gloriously lovely weekend, we went on a nice long bike ride with friends. It really began to seem like we should not be on bikes though, or like some force was telling us that we shouldn’t be enjoying ourselves quite so much. Stories from one day on the trail. Before we left we’d gotten word that some kids had strung saran wrap over the trail at neck level as a prank. So…I dunno what they expected to accomplish other than hurting someone severely? Then, as we were riding, a tree fell on one of our friends. For real. That happened. Fortunately she was not hurt badly, though she ended up with a cracked and dented helmet, and smashed handlebars. After a trip in the ambulance to a local med center, she was found to have no broken bones and they sent her home. We continued on our way, as we’d gotten a bit split up due to that accident. We had to figure out how to get the bikes of the two that went in the ambulance somewhere safe. The contingent that waited with the bikes continued on their way to catch up with us, where they were scared by a guy on a bike in a clown mask. (Seriously, that fad needs to end.) And then on the way home there were a group of kids rolling car tires down the hill at cyclists. One would imagine that when taking trails rather than roads, a cyclist would be safe!!! But, not the case for us all on Sunday. It was still a lovely ride though despite the obstacles. That’s about it from here. I’ve got my cotton slub yarn project going quite well and I look forward to showing that off tomorrow. It’s a simple knit that I am enjoying immensely. And, while I’ve been blog quiet for lack of stuff to post about, I’ve also been enjoying keeping up with the adventures of blog friends in blog land. About one of my absolute favorite independent business owners. Dyeabolical Yarns. I would say that at this point, 80% of what I purchase (Which, sadly, is NOT a lot, due to having really overdone it in the yarn buying department in the past) is from Rachel’s shop. You can find her here or here. I’ve been following this shop since the very beginning of 2009. In fact, I can show you my first project. I’d picked the fiber up from a destash, and that’s the fiber that sold me completely. Here’s the in progress photo. And the finished photo. At some point, I struck up somewhat of an online friendship with Rachel that I feel has benefitted me so greatly. I’ve been able to do sample knitting for her in the past, and try a new yarn or fiber from time to time. These are absolutely wonderful fun things for a person like me who really enjoys trying something new. 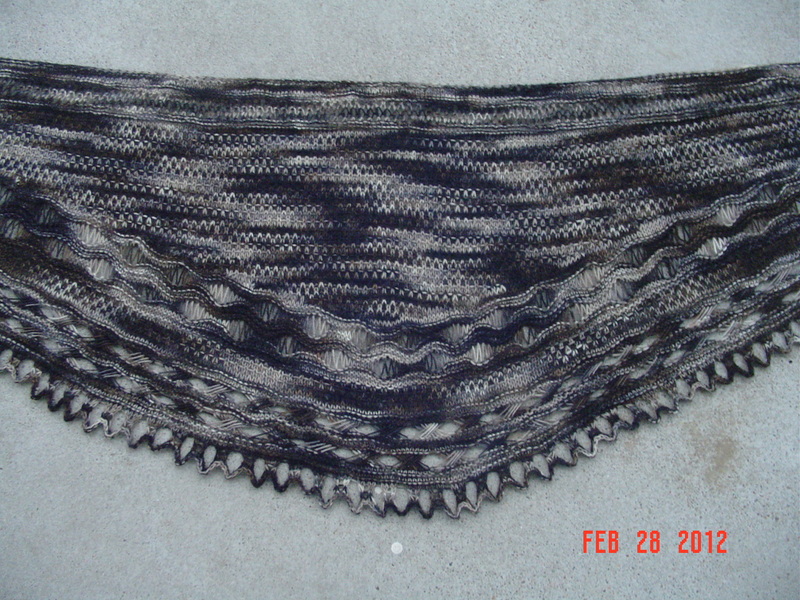 There’s one shawl in particular I never would have tried without it being requested as a sample knit. It had linen stitch, no problem, and it had dropped stitches, again no problem, and then these weird stitches where you passed a whole bunch over another whole bunch, and I can’t even remember how that worked now. I just remember knowing I wouldn’t have even tried them without the request, and they were indeed fun. My current spin project is, again, a dyeabolical fibers project. I have taken Fate, PhD and Steampumpkin colorways and combined them. I just finished the first bobbin. These are now retired colorways. I have to say that it’s always my goal to own every single one of her colorways at some point, though I don’t actually achieve that. However, if something is getting retired, I HAVE to pick it up lest I miss out completely and regret it for the rest of time. These were the two I chose from the latest retirement, though I could have filled my cart to the brim. Since this is an 8 oz. project, it’s going a bit slow right now. Plus, you know, the whole weird and unexpectedly extra long sweater project. But, another thing happened that involves Rachel this week. Way back when, she had this cotton slub yarn. When dyed in her wonderfully saturated colors, it made yarn that I loved so much! Here’s an example in action, with a close up of a young Miss Bug.She wore this all the time. This yarn felt great to knit, and had such an interesting texture. I loved it so much. But sadly, the mill Rachel was using quit making the yarn, and that was the end of the cotton slub yarn opportunity. I still wax poetic about that yarn on the regular. And look what arrived in the mail for me yesterday! That is…an incredibly generous gift from Rachel. It’s the last of her cotton slub yarn. I had originally thought maybe I could get a nice slubby stripy cotton sweater out of it. But, I think I’ve changed my mind. I want a nice big slubby stripy shawl instead. I just want to be able to wrap myself in it. I haven’t yet chosen a pattern, but I will! I think I’ll try to get a good handle on the yardage and then go from there. I have some ideas in mind, but such a sought after yarn should get a perfect pattern, so I don’t want to rush it. I might also add the super cool knitting row counters she slipped into that package! You can get them here and I cannot WAIT to give mine a try! Inspiration. My epic queen sized Lizard Ridge blanket. I saw the beginning of her Lizard Ridge way back when. And I HAD to knit it. I began collecting colors, and I began knitting it. She set hers aside for ages. I set mine aside for ages. It was only when she finished hers and posted about it that I HAD to finish mine too. I am so happy I did! It’s beautiful, and it’s the one we use daily, and it always gets compliments when we have company over who haven’t seen the house before. Suffice it to say, Rachel has been a huge influence in my knitting and spinning over the years, and if you aren’t paying attention to her, you absolutely SHOULD be. She’s a fantastic person, in addition to being a consistently kind, fair, and honorable business woman. And, in a world of yarn and fiber small business owner drama, she’s a person you can trust. Not a hint of drama in all the years I’ve been following along. Simply amazing artistry combined with the ability to run a solid business. In addition to all of this, she’s got a ravelry group, a podcast, and recently began a facebook group called Wool Ewe Please? where you can join and post whatever lovely knitting or spinning you want, and enjoy the posts of other like minded crafters. Go find her, follow her, and be inspired!